Missing pet posters are a great way to get the word out about your missing pet. You can print your own pet posters with no waiting for them to be delivered and you can print off as many copies of your pet poster as you require using our system. 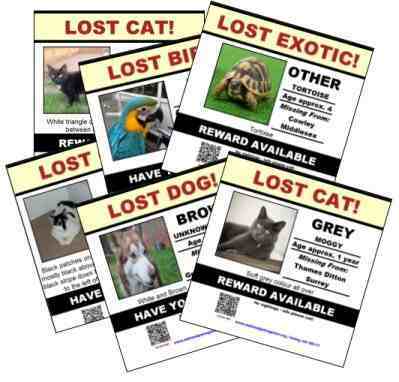 You will need to add your own phone number to the lost pet posters after they have been printed. This is to allow you the option of adding a number of your own choice. We do not offer a third party phone number service as giving you the ability to add your own number will cut out any delays of getting information regarding your missing pet to you. The missing pet poster will be generated automatically from your pet listing information in an eye catching design which will be noticed and will fit nicely on an A4 sheet of paper. A scannable QR Code will be added to the missing pet poster which will allow Smartphone users to access the listing online. A simple, eye catching design with important information regarding your pet will be added to the lost pet poster automatically. The poster is available to be printed from your members area or direct from the public pet listing page so any user can download and print including any helpers who live in the area. All pets which are added to our lost pet register will have a pet poster automatically generated by our system. You do not need to use this feature but if you can, print off as many copies as you require and distribute. If you have friends or relatives in the local area, they too can freely print off and distribute the missing pet posters on your behalf.